SNES The Mask (USA) in 05:45.17 by TASeditor. Based loosely on the plot of the movie of the same name, this game is about a man named Stanley Ipkiss, who finds a powerful mask known as The Mask. However, the evil Dorian Tyrell has also become aware of this and kidnaps his girlfriend in order to obtain it. One of the traits The Mask seems to give Stanley is extreme speed, so naturally, aside from a couple of boss fights, the gameplay is extremely fast throughout the movie. 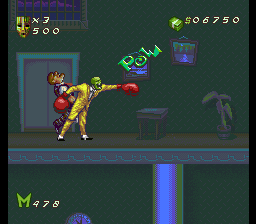 The Mask also has a variety of special powers, most of which are seen in this run. These powers cost M points to use, which have to be managed carefully over the stage. This run is an improvement over the previous one due to general optimizations and better use of glitches. Those who watched the previous run should especially see the massive improvement to the sewer stage.